Scientists on NASA's Cassini mission to Saturn now have a better understanding of why the odd moon Hyperion has such an unusual appearance. The crucial factor in creating the strange, sponge-like appearance of Hyperion appears to be its extremely low density, say Cassini scientists in a research paper being published in the July 5 issue of the journal Nature. The researchers examined Cassini spacecraft images and other data on the moon's mass acquired during encounters with Hyperion over the past three years. 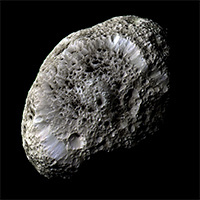 Hyperion is covered by a large number of medium-sized, well-preserved craters. "Careful mapping of features showed that its bizarre appearance probably results from a convergence of rather routine effects," said Dr. Peter Thomas, a Cassini Imaging Team member working at Cornell University in Ithaca, New York. Cassini's closest encounter with Hyperion, in September 2005, allowed accurate measurement of the moon's mass and size, which showed it is only slightly more than half as dense as water. "The close flyby produced a tiny but measurable deflection of Cassini's orbit. Therefore, the orbit determination, carried out by our Italian colleagues, allowed us to estimate the mass with fairly good accuracy," said Cassini radio science deputy team leader Nicole Rappaport of the Jet Propulsion Laboratory in Pasadena, Calif. "Combined with the determination of Hyperion's volume from imaging data, this provided an accurate computation of its density." Initial conjectures about the origin of Hyperion's strange surface invoked dark materials accumulating on crater floors that subsequently got warmed by sunlight and melted deeper into the surface. However, the new analyses have shown that the moon's low density, and therefore low surface gravity, may cause craters to form differently from those on other, denser bodies that have been explored in the Solar System. According to the researchers, impactors smacking into Hyperion's porous outer layers form craters more by compressing the surface than by blasting out material, as they do on denser bodies. Additionally, the moon's low gravity means that any material ejected from craters on Hyperion has a good chance of escaping completely and not re-impacting the surface, making Hyperion's craters look sharper and less blanketed by debris than on other bodies. These new results about Hyperion's craters accompany another paper in the same journal issue which details the moon's composition. Both are important to understanding this unique moon's history and evolution. More information on the other paper can be found at http://saturn.jpl.nasa.gov. "With time, we are coming to understand the various planetary processes that shape the bodies in our solar system," said imaging team leader Carolyn Porco. "And this latest work on Hyperion is a beautiful demonstration of that." The Cassini-Huygens mission is a cooperative project of NASA, the European Space Agency and the Italian Space Agency. The Jet Propulsion Laboratory (JPL), a division of the California Institute of Technology in Pasadena, manages the Cassini-Huygens mission for NASA's Science Mission Directorate, Washington. The Cassini orbiter and its two onboard cameras were designed, developed and assembled at JPL. The imaging team consists of scientists from the U.S., England, France, and Germany. The imaging operations center and team leader (Dr. C. Porco) are based at the Space Science Institute in Boulder, Colo. The Cassini radio science instrument is distributed between the spacecraft and the stations of the Deep Space network. The elements of the radio science instrument onboard the spacecraft were developed via an international agreement between NASA and the Italian Space Agency.